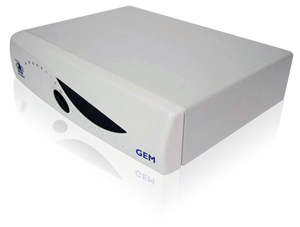 The AdderView GEM is a fully featured desktop KVM switch that is easy to install and operate. Available as a 2 port AVG2 and 4 Port AVG4, It inherits many of the features you expect from Adder Technology yet at a remarkable price achieved by manufacturing the product in the far east. Designed for ease of use and maximum compatibility with new and existing computer systems GEM features SmartBoot, which intelligently allows all connected portable or desktop computers to boot as if they had their own dedicated keyboards and mice attached. It also supports PC/AT and PS/2 systems and provides high video bandwidth with low distortion at screen resolutions up to 1900 x 1440. This makes the GEM the ideal choice for use with larger monitors in CAD or DTP environments. The latest monitors equipped with DDC interfaces are also supported and this facilitates true "Plug-and-Play" compatibility. A monitor can be plugged straight into the monitor port. Supports VGA/SVGA/XGA/XGA-2/SXGA/UXGA video. VESA DDC1 and DDC2 signalling supported. Screen resolution of up to 1900 x 1440. Screensaver feature support. Supports AT and PS/2 keyboards automatically. PS/2 keyboards plug in directly and keyboards with AT style 5 pin DIN plugs require an adaptor. Automatic mode emulation ensures that the keyboard is correctly programmed to the state expected by the CPU whenever the channel is changed.Type 1, 2 and 3 keyboards are supported. Multiple GEMS may be linked together via the options ports to provide synchronised switching for multiple videohead applications. User-selectable to prevent unauthorised access to connected CPUs.The password is safely stored in the unit's EEPROM memory. User Flash upgradeable firmware by downloading from a PC's serial port. Metal case 230 x 50 x 170 mm with plastic front display panel. Interface powered operation. Optional 5Vdc, 500mA PSU available. Complies with European EMC directive 89/336/EEC. CE marked and FCC class A compliant. AVG2 - Single keyboard, monitor and mouse to 2 computers. AVG4 - Single keyboard, monitor and mouse to 4 computers. A PS/2 type Logitech or Microsoft compatible mouse is required to control the switch. Use of a 3 button mouse also allows channel switching. Many Internet wheel/scroll mice including Scrollpoint and Explorer are also supported. Prompt and stream modes supported for maximum portable and desktop mouse compatibility. All mouse connections from the GEM to PCs support both serial RS232 and PS/2 mice in any combination. 2m if interface-powered or 10m if PSU used when attached keyboard, monitor and mouse. 5m if interface-powered or 30m if PSU used when attached to CPU or cascaded GEM. Used for selecting channels and entering configuration mode. Display shows selected CPU, data activity from keyboard or mouse and switch status. Adjustable to display only active ports or all ports in sequence.